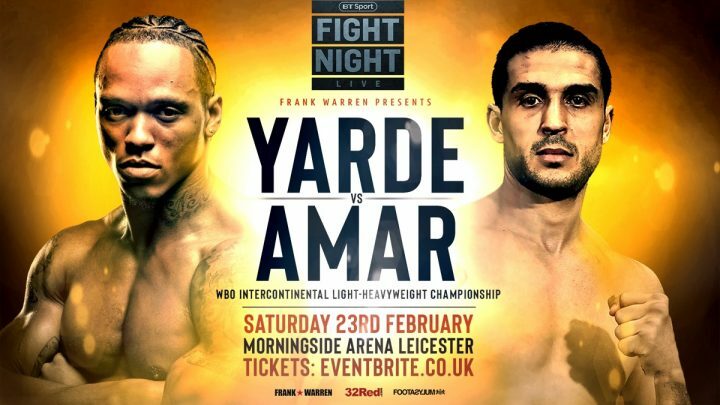 By Jeff Aranow: Unbeaten light heavyweight contender Anthony Yarde (17-0, 16 KOs) will be facing the always tough Mehdi Amar (35-6-2, 16 KOs) in a 10 round bout on February 23 on the undercard of Sam Bowen vs. Ronnie Clark on BT Sport at the Leicester Arena, Leicester, UK. Yarde, 27, will be defending his World Boxing Organisation Inter-Continental Light Heavyweight belt against the 36-year-old Amar. It’s somewhat odd that a fairly popular fighter like Yarde would be on the undercard of British super featherweight champion Sam Bowen (14-0, 10 KOs) in his defense against 33-year-old Ronnie Clark (21-4-2, 10 KOs). Yarde, #1 WBO, #5 IBF, should be headlining his own fights at this point rather than performing as the B-side attraction on an undercard of a fighter that will likely never win a world title or even fight for a world title in Bowen. It’s strange. It must have to do with tickets sales and such. Although the Yarde-Amar fight has already been heavily criticized by boxing fans ever since the news of the fight was announced on Thursday, it’s not a bad match-up. Amar gave the highly rated Oleksander Gvozdyk (16-0, 13 KOs) all kinds of problems last year in March 2018 in a losing effort. Gvozdyk won the scores 117-111, 116-112 and 118-110. Amar definitely had his moments in that fight, hurting Gvozdyk badly in the 11th round. Amar came close to knocking Gvozdyk out in that round. Even in the 12th, Amar was still punching very hard, and making Gvozdyk earn his victory. Amar going the 12 round distance with Gvozdyk shows that he’s not just an easy mark like some would think. Amar has a real chance of beating Yarde if he can get to his chin. Amar’s 37% knockout percentage is a little misleading, as he’s a better puncher than that. He’s got power, and he’s quite capable of knocking Yarde out if he can get to his chin. Yarde was hurt by journeyman Tony Averlant last year in February 2018. Yarde eventually got Averlant out of there in the 7th, but he was clearly bothered by the shots the French fighter was hitting him with. That performance by Yarde makes it difficult to imagine him ever beating any of the talented light heavyweights in the division. Yarde looked badly flawed. Amar is a better fighter than Averlant, and with more punching power. There’s a good chance that Amar could knockout Yarde if he puts hands on him the way Averlant was doing. It would be great to see Yarde step it up in 2019. He’s about to turn 28, and he doesn’t look like he’s improving fighting the lesser opposition that his promoters are feeding. Yarde is ranked #1 with the World Boxing Organization at 175. It would be a good idea for Yarde to challenge WBO champion Eleider Alvarez before someone better comes along and dethrones him. Alvarez is very beatable, and he’s the ideal champion for Yarde to challenge for his belt. Yarde would have a very tough time trying to hang with IBF champ Artur Beterbiev, WBA champion Dmitry Bivol or WBC champion Gvozdyk. Those guys are too technical, too powerful and too experienced for a raw fighter like Yarde, who had only 12 fights as an amateur before turning pro in 2015. It would take years for Yarde to catch-up to where Bivol, Gvozdyk and Beterbiev are right now. The problem is, Yarde doesn’t have 10 years to catch up to those guys. He’s going to have to make the most of what he has while he’s still young. There’ no point in Yarde trying to wait out the likes of Beterbiev, Bivol and Gvozdyk, because most of those guys are the same age as him. Amar won the vacant European Boxing Union light heavyweight title in 2015 in beating Adasat Rodriguez by a 12 round unanimous decision. Amar twice beat Serhiy Demchenko before losing the EBU 175 title to former WBO super middleweight champion Robert Stieglitz by 12 round unanimous decision in 2016. Besides his loss to Stiglitz, Amar has losses to Hassan N’Dam, Oleksandr Gvozdyk, Nadjib Mohammedi, Mehdi Bouadla and Pierre Moreno. It’s unclear what kind of statement that Yarde is expecting to make in defeating Amar. He’s already been beaten six times in the past. The only real statement Yarde can make in beating Amar is if he can knockout him out early in the fight. Amar has only been stopped once in his 16-year pro career, and that was to Nadjib Mohammedi in a 4th round knockout in 2012. If those two fought right now, it would likely be the reverse happening. Amar has improved a lot since then, whereas Mohammedi is clearly on the downside in having lost his last two fights to Vladimir Shishkin and Fedor Chudinov. It’ll be interesting to see if Yarde’s promoter finally lets him challenge for a world title this year, as he’s been in position to fight for a world title since 2018. If Yarde doesn’t take the shot sooner or later, it’s likely that he’ll see his rankings drop. You can only have a fighter up there at #1 for so long before the sanctioning body gives up on them when they fail to take a title shot. Yarde is going to have to be careful with Amar. This isn’t a guy that he can just jump on with his Mike Tyson style of fighting to try and mow down without having to worry about getting hit back with something big. If Yarde gets careless against Amar, he could get knocked out. It wouldn’t be surprising at all. Yarde needs to box this guy, and pick spots where he can slug. It would be a bad idea for Yarde to come out firing shots nonstop hoping to KO him. A loss for Yarde in this fight against Amar will put him back at square one, but at least he’ll know what his true level is. Right now, there’s a lot of question marks about Yarde’s talent level. The boxing public sees Yarde destroying guys, but they’ve always been weak 2nd and 3rd tier fighters, and not anyone that has kind of talent. Seeing Yarde buzzed by shots from journeyman Averlant was an eye opener. That fight showed that things aren’t what they appear with Yarde. He’s a good fighter, but one that’s nowhere near as good as his high #1 ranking, and his inflated 17-0 record.